Codeine cough syrup is no longer available over-the-counter (OTC) without a prescription. Record keeping by the dispensing pharmacist is now mandated by a new government notification. This one legislation will aid relapse prevention in abstinent Corex cough syrup addicts. Many former codeine addicts have relapsed after visiting their dispensary for another medication; the pharmacist casually offers opioid containing Corex cough syrup and provides a visual cue to trigger craving and retard their progress through the stages of change. Codeine cough syrup addiction is fuelled by dispensaries that distribute litres of codeine in the form Corex Cough Syrup and other brands like Mits Linctus. The key ingredient in these ‘cough syrups’, Codeine, is derived from opium and is an addictive substance. Codeine containing cough syrup abuse made its entry to India in the 1990s and since then has contributed to the steadily increasing opioid dependence case-load.The estimated number of opium users in India is well over 5 million with codeine being a major oral source. Opioid dependence in a de-addiction centre increased significantly from 37 to 52% over the last three decades. Codeine dependent individuals are exposed to visual cues of Corex and other codeine containing cough syrups at every visit to the dispensary. 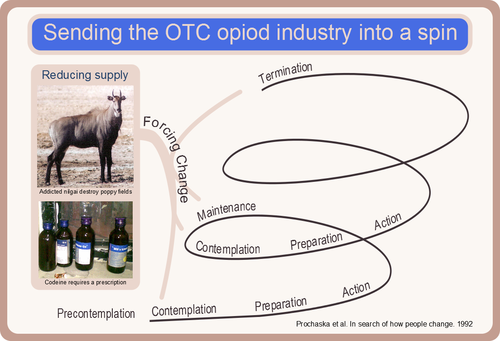 Modification of addictive behaviours involves progression through five stages of change - precontemplation, contemplation, preparation, action, and maintenance. 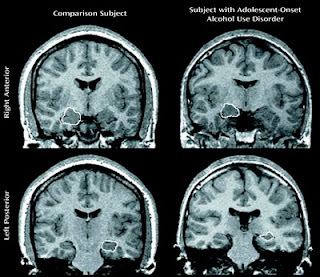 Individuals cycle through these stages many times before termination of the addiction. During relapse individuals regress to an earlier stage of codeine use. Stimulus control - avoiding or countering reminders of codeine use - is a key process for relapse prevention on the spiral of change. Cutting off easy access in the dispensary aids stimulus control and helps prevent relapse to codeine use. The common sight of multiple discarded codeine cough syrup bottle on stairwells would also disappear (see image). Pharmacy-based approaches help in minimising the harm associated with OTC medicine abuse, and supporting and treating affected individuals. Alerting or counselling customers to the abuse potential of products is effective. Raising awareness of the addiction potential of codeine cough syrup is necessary for both the public and the prescribers (many doctors are unaware of the ingredients that go into Corex and other cough syrups). Preventing access is the domain of the government. Regulating and monitoring codeine prescription and dispensing is a welcome step. The finance ministry is now attempting to enable tracing of batches of codeine containing cough syrups to their suppliers in a bid to control smuggling of Corex and other codeine containing cough syrups. Unexpected help in relapse prevention by restricting supply has also come in the form of mother nature. Opium growers in Mandsaur, MP are ruing the increasing numbers of nilgai (Boselaphus tragocamelus) that have developed opioid dependence after chance grazing in farms that were once grassland. The nilgai now run amok and destroy swathes of poppy fields in search of their fix. Richard J. Cooper. J Subst Use. Over-the-counter medicine abuse – a review of the literature. Published online Oct 3, 2011. doi: 10.3109/14659891.2011.615002. Apr 2013; 18(2): 82–107. Gary Reid and Genevieve Costigan. Revisiting ‘The Hidden Epidemic’ A Situation Assessment of Drug Use in Asia in the context of HIV/AIDS. The Centre for Harm Reduction, The Burnet Institute, Australia. 2002.